Elan: What’s been going on in Puerto Rico? Why are people upset? Danilo: Well it all goes back to the 2008 financial crisis. The US entered into a recession and Puerto Rico followed, and there’s just never been a recovery. We’ve been in an economic freefall which has only been made worse by politics of austerity coming from our government. Luis Fortuño [Puerto Rico’s governor from 2009-2013] oversaw massive layoffs of 50,000 government employees, a series of public school closures, and regressive tax measures that hurt the working class combined with tax cuts for foreign corporations. Then, in 2016, under Governor Alejandro Padilla, the PROMESA Bill was passed which established the “Fiscal Oversight Management Board.” PROMESA made Puerto Rico a colony in everything but name, establishing this board, made up of seven members of U.S. Congress, totally unelected by the Puerto Rican people, that has the power to veto any legislative measures that the Puerto Rican government makes, basically stripping us of any decision making power in our own country. The U.S. did this so that they could get the maximum amount of debt payments from Puerto Rico, even if it meant harsh austerity. And our debt payments aren’t even to the U.S. government, it’s to Wall Street banks and corporations. Now, our new governor is like Luis Fortuño on steroids. He tells the media that he’s not going to lay people off but then passes laws undermining workers’ rights, part of the overall neoliberal agenda, and his new proposed fiscal plan includes $1 billion in cuts to health care, $500 million in cuts to universities, and $300 million in cuts to K-12 education. Of course, this plan has been approved by the Fiscal Control Board. So this is why people are upset. Elan: What role do you see the system of capitalism playing in the crisis in Puerto Rico? Are there a lot of socialists within the student and workers’ movement? Danilo: Within the student movement, everybody is against all forms of exploitation, which is of course a principle of capitalism. So in this sense, students are completely aware that the issues we’ve been facing are a symptom of the capitalist market agenda. There’s no discussion there. Some people might have a phobia to the word “socialism,” but there’s an equal or even greater aversion to capitalism, private interests, and privilege. Elan: Are student protests the most prominent anti-austerity protests happening right now? What type of support does the movement have from non-students? Danilo: Yes, definitely. On May Day, many workers’ unions will be going on strike alongside the students, but even they admit that the students have been the ones with the baton. We’ve been actively building support outside of just students. Day by day, we try to get articles published in local newspapers and we’ve been noticing recently that parents, aunts and uncles, and even some political figures, are starting to sympathize more with students’ claims. More and more people are starting to see the measures being taken by our government for what they are: crude austerity that benefits the rich, not us. Elan: May 1st is a big deadline coming up for Puerto Rico to “restructure their debt.” It’s also May Day, or International Workers Day. From both the government’s side, and the students and workers’ side, what’s going to happen on May 1st? Danilo: So right now there’s a moratorium on our debt. We don’t have to make any payments until May 1st, and if we don’t pay enough by then, Title III of PROMESA will go into effect, which will basically be our version of bankruptcy. In terms of what’s going to happen, I think the government is going to make the largest amount of debt payments they can. That’s what all this austerity has been for. On our side though, there are plans for May 1st for all the major workers’ unions to go on strike, and the student strike will continue. It remains to be seen if it’s going to be a one-day general strike, or go on for longer. 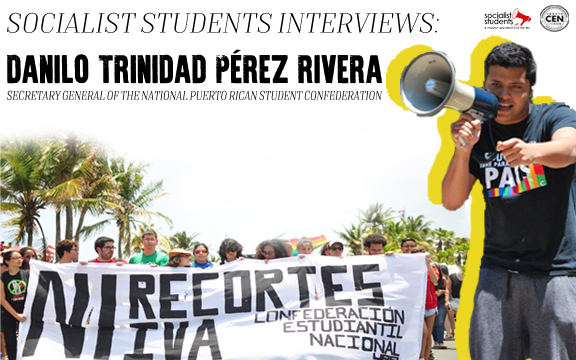 The students and workers’ unions will all be gathering on the Golden Mile – Puerto Rico’s equivalent of Wall Street in New York City – to try and shut down all the big corporate financial offices. Elan: What would it take for the movement to win and stop all privatization and cuts to education? Danilo: The number one challenge is convincing people that isn’t just a student movement and that it’s a movement for all people that everybody has to get involved in. An uneducated society doesn’t work for anybody – students, workers, and not even for the moneyed interests. This is why it’s great that the unions are joining us. The unions are our fathers and mothers. The fight against tuition hikes and school closures is just the flash point. We’re fighting to defend all the people of Puerto Rico, and May 1st is the next step in that process. Elan: The US media is hardly reporting on what’s happening in Puerto Rico. If you could send a message that would be spread around the US student movement, what would it be? Danilo: Don’t be afraid of acknowledging that things are wrong and that there has to be change. Let it be seen that Puerto Rico is being taken advantage of. Put pressure on your local congresspeople of each state to take action, because the only regulating body on top of the Fiscal Control Board is the U.S. Congress. At the end of the day, we are American citizens. There are more Puerto Ricans in the U.S. than in Puerto Rico. Eventually, the democratic spirit of the people will impose itself on those in power. A resolution passed earlier this month by the Union of Aqueduct and Sewer Workers in Puerto Rico. The union proclaims emphatic support for the ongoing student strike against cuts to education, privatization of educational institutions, and school closures. As Danilo said, this is not just a student movement. All workers have a stake in the fight against austerity and when workers and students stand together, we can win. See the statement from the Union of Aqueduct and Sewer Workers below!